The son of Samuel and Leah Rachel, John was born in 1892 in Gornal. They were living in Tipton in 1901 and by 1911 they were at 19 Park Street South, Wolverhampton. John and his parents were joined by his siblings Frederick Howard, Samuel, Gladys Maud, Dora Lydia, Reuben, Clara, Ernest, Florence Beryl and Leonard. John was working as a whitesmith, a metal worker who deals in tin, light metals and white enamelled goods. In 1913, he married Nellie Eagle in Wolverhampton, and the couple had two children – Irene N. (1913) and John T. (1915). Unfortunately, Irene died in 1915, not long before the birth of her younger brother. At some point, John worked for Messrs Green and Russell of Thomas Street, Wolverhampton, and the family lived at 10 Green Lane, Wolverhampton. His loss was a big blow to the battery, for his kindly and cheerful spirit had made him popular with all ranks. His place will be a difficult one to fill. On behalf of the battery, may I offer you my heartfelt sympathy in your great loss. The Express & Star of 3 November 1917 carried the same article. John is buried at the Belgian Battery Corner Cemetery, and is remembered on the war memorial of St Luke’s Church, Blakenhall, although he appears to be listed as “J. L. Parkes” on there. The son of Francis William and Sarah Ann Bishop, George was born in Wolverhampton in 1896. In 1901 they were living at 23 Moor Street South, Wolverhampton, along with George’s siblings John Henry, Ellen, Francis W., Frederick and Annie. George attended Dudley Road Council School. They were at 26 Cobden Lane, Blakenhall, Wolverhampton, by 1911, and george had become an inker for a Boot Factory. Before the war, he worked at Gibbons in Church Lane. He enlisted with the 2nd Battalion of the Leinster Regiment (number 10457). 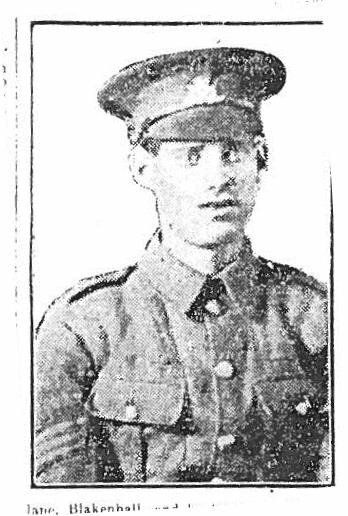 He was killed in action on 14 March 1916, and this was announced in the Midland Counties Expresson 25 November 1916 (although his first name was just given as Thomas). He is buried at Menin Road South Military Cemetery in Belgium, and is remembered on the Roll of Honour in St Luke’s Church, Blakenhall. Charlie was born in Wolverhampton in 1891, the son of Charles and Harriet Perry. By 1911, they were living at 65 Byrne Road, Blakenhall, Wolverhampton, along with siblings Henry, Harriet, Lily May and Doris. Charlie was a clerk for a motor works. He later worked as a clerk for Messrs. Bussey, wholesale grocers, of Bilston, as well as being the manager of the Electric Picture Palace at Bloxwich. He was a member of the choir at St Paul’s Church, Wolverhampton, and at St Luke’s Mission, Dudley Road. Charlie enlisted with the 2nd/6th Battalion of the South Staffordshire Regiment (service number 241649), and became a Corporal. In 1916, he was on active service in Dublin during the Irish rebellion. On 21 April 1917, he was crossing an open field to the trenches when he was hit by a German shell, and killed instantly. He was featured in the Midland Counties Express on 12 May 1917. He is buried at Jeancourt Communal Cemetery Extension, France, and he is remembered on the memorial at St Luke’s Church, Blakenhall. Christopher was born in Wolverhampton on 3 February 1890, the son of William and Sarah Ellen Turner. In 1901, they were living at 127 Dunstall Road, Wolverhampton, along with Christopher’s siblings Beatrice A., Harold Edwin, and Horace Maxwell. By 1911, they were at 32 Bromley Street, Blakenhall, and Christopher had a younger sister, Kate Evelyn. The 22-year-old Christopher was an engineer’s fitter for a motor manufacturer. Later he worked for the Weldless Steel Tube Company Limited. He married Emily Elise Pickford at St Andrew’s Church, Wolverhampton, on 2nd February 1912, and they had Christopher (1913), Horace (1915), Jon M. (1920) and Harold E. (1928). On 8 August 1914, he enlisted with the Army Service Corps (number 3237). His trade was now given as motor driver. He served in France until September 1915, when he was wounded in his left foot. On 20 February 1916 he was discharged as being no longer physically fit for war service, due to an injury to his right foot. Whether this was the same injury as above is unclear. He was awarded the Silver War Badge (number 60786) on 7 October 1916. He survived the war and was living as 7 Fellows Street, Wolverhampton, in 1939, still working as a motor mechanic. He died on 27 February 1946 at the Royal Hospital Wolverhampton, by which date his address was 208 Bushbury Lane. The value of his effects was £195 15s. 6d. John was born in on 26 January 1884 in Wolverhampton, the son of William and Elizabeth Cook of 48 Chapel Street, Blakenhall, Wolverhampton. On 2 March 1900, John enlisted in the South Staffordshire Regiment (number 5872), when his trade was given as tube maker. Before the outbreak of war, he served mainly in South Africa and India, and was promoted to Lance Corporal in September 1905. He was transferred to the Army Reserve in March 1908. In 1911, he was listed as a labourer and living with his parents at 9 Crescent Row, Wolverhampton. John married Annie Rudge at St Mary’s Church, Wolverhampton, on 16 April 1911, and they had a daughter, Phyllis, in 1913. I am quite safe after a big battle with the Germans. I was never in such a fight in all my life. We shot the Germans down as fast as we could load our rifles, and captured about 550 of them, but we have dropped back at last for a bit of a rest, and it is like being in heaven, for the last day’s fighting was hell on earth. He was promoted to Corporal in May 1915, and Sergeant in November 1916. In September 1917, he was transferred to the Royal Defence Corps (number 66812). On 14 November 1917, he was discharged as being no longer physically fit for war service due to sickness. He was awarded the Silver War Badge (number 269449) on 10 November 1917. John died in Wolverhampton in 1963. William was born in Wolverhampton in 1891, the son of Kate Egan. He was living with his mother and brother John T. at 13 Derry Street, Wolverhampton, in 1901. By 1911, he was a boarder in the home of John Wickes at 84 Duck Street, Wolverhampton. William was a general labourer working for the Chromographic Enamel Company. He married Nancy Price in Wolverhampton in 1913. William enlisted with the 1st/6th Battalion of the South Staffordshire Regiment (number 1337), and became a Lance Corporal. He first served in France from 5 March 1915. Unfortunately he received a gunshot wound and died later in hospital in Etaples, France on 8 August 1915. This was reported in the Midland Counties Express on 14 August 1915 (although his surname was incorrectly printed as “Egom”). His address according to the article was then 25 Cobden Lane, Blakenhall. He is buried in Etaples Military Cemetery and remembered on the memorial at St Luke’s Church, Blakenhall. Dennis was born in Stourport in 1896, the son of Thomas and Florence Crilley. In 1901, they were living in Hartlebury along with Dennis’s sister, Norah. The family had moved to 12 Fowler Street, Blakenhall, Wolverhampton, by 1911, and Dennis had gained three brothers – Hubert, Frank and Clarence. Dennis worked as a mechanic for a motoring manufacturer. Dennis enlisted as a Private in the South Staffordshire Regiment (service number 9983). He first served in the Balkans from 21 July 1915. On 15 September 1916, his name was listed in the Express & Star as having been wounded, but he recovered. In the course of the War, he rose to become a Corporal and later Second Lieutenant with the 12th Sherwood Forresters and with the 22nd Manchester Regiment. His address on his medal card was given as 31 Brevitt Road, Blakenhall, Wolverhampton. Dennis survived the war, and married Agnes Parton in Wolverhampton in 1920. On 25 April 1924, his name appeared on a list of British passengers on the Montcalm ship, bound for Quebec, Canada, from Liverpool. His trade was given as “Fitter”. His reason for going to Canada was “to make my home”, but he was not accompanied by his wife. He was due to stay with his brother, Hubert, who was already living in Ontario. I have not been able to trace further details of Dennis’s life. William was born in Wolverhampton in around 1895, the son of George and Agnes Clark. They were living at 43 Drayton Street, Wolverhampton, in 1901. By 1911, they had moved to 67 Hall Street, Blakenhall, Wolverhampton, and William had gained a brother (Albert Edward) and sister (Nellie). By this date, William was a labourer in the iron trade. William enlisted as a Private in the 1st Battalion of the Grenadier Guards (number 25342). William was involved in the Battle of Cambrai, and was killed in action on 1 December 1917. He is remembered on the Cambrai Memorial in France, as well as on the roll of honour of St Chad and St Mark’s Church. By the date of his death, his parents were living at 1 House, 23 Block, Thompson Avenue, Wolverhampton.